The continuous development of the worldwide coastal areas have lead to the increase of the risk due to different types of hazards, natural or anthropic, permanent or episodic, which might endanger the health and stability of ecosystems and communities from these areas. Thus, even if tsunami is a relatively rare phenomenon comparing to other natural events, it represents a major natural danger involving a significant flooding risk in lower areas near the shorelines and for coastal communities and therefore, increasing the society resilience to this phenomena in exposed areas is very important for minimizing damage and possible destructive effects on the environment in these areas. The recent worldwide earthquakes from 26th of December 2004 in Sumatra and 11th of March 2011 in Japan, which triggered tsunami waves up to few tens of meters, have shown how devastating the consequences of such events can be. Such events reveal the necessity of developing different actions used in the future for the reduction of damages and destructions caused by tsunamis in coastal area, became quite obvious. Thus, in the frame of the EC Programme-FP7 ASTARTE project (Assessment, STrategy And Risk reduction for Tsunamis in Europe), we conducted a questionnaire survey among people living, working, or visiting Eforie Nord site (Figure 1) to assess the preparedness skills, resources and attitudes within the communities towards the tsunami phenomenon at the Black Sea. That is to say, the purpose of the survey was to assess the preparedness skills, including risk perception and attitudes of the tsunami risk among the population of Eforie Nord city (Romania). The tsunami questionnaire elaborated in the "Building Tsunami Resilient Societies" work package of the project has been translated in Romanian language, the questions referring to: interviewee's relation to Eforie Nord site, information about interviewed people, tsunami hazard knowledge/risk perception, evacuation issue, awareness of the existing warning system, information, and communication. The results obtained after the survey confirm that coastal communities from Romania are not resilient to tsunami hazard. Our respondents have mentioned from natural and anthropic types of hazards, the tsunami as third rank in Eforie Nord test site, coming after earthquakes and storms. Whatever the respondent's status, earthquakes and sea withdrawal are cited as tsunami warning signs by 62% and 60% of the respondents, respectively (Figure 2). Regarding the perception of a future tsunami event in Eforie Nord, 36.3% of the respondents think that the place could be affected by a tsunami and the tsunami wave could reach more than 2-5 meters (heights cited by approx. 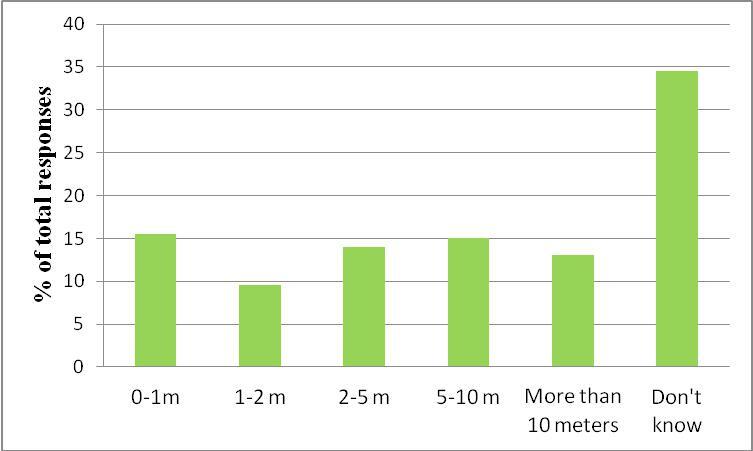 14% of respondents) or even more than 5-10 meters (values cited by 15% of interviewed people) (Figure 3). 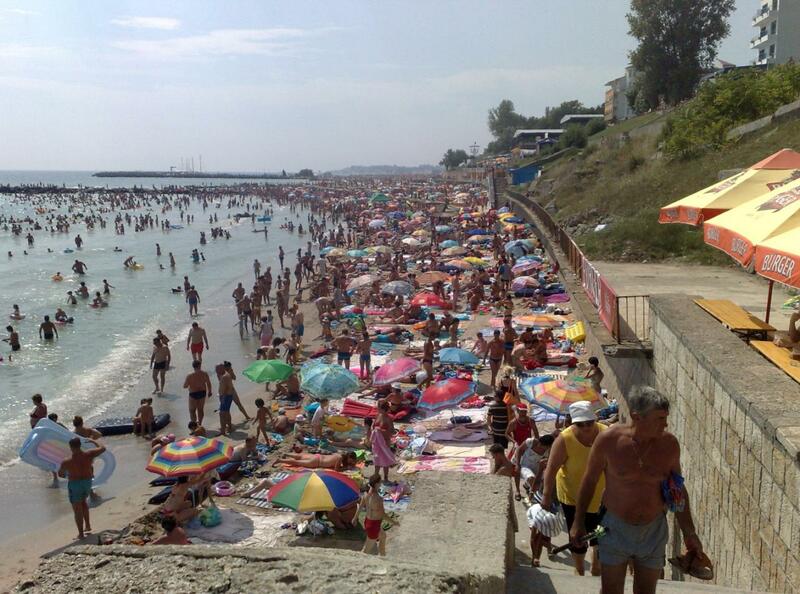 In the case of a tsunami in the Black Sea, there are no prevention and mitigation measures of the effects nor evacuation plans for population in all the Romanian coastal zone. The tsunami phenomena in not considered a risk by the General Inspectorate for Emergency Situations of Romania (IGSU), and therefore NIEP is doing first steps in order to include the tsunami at least into the minor risk type of events.